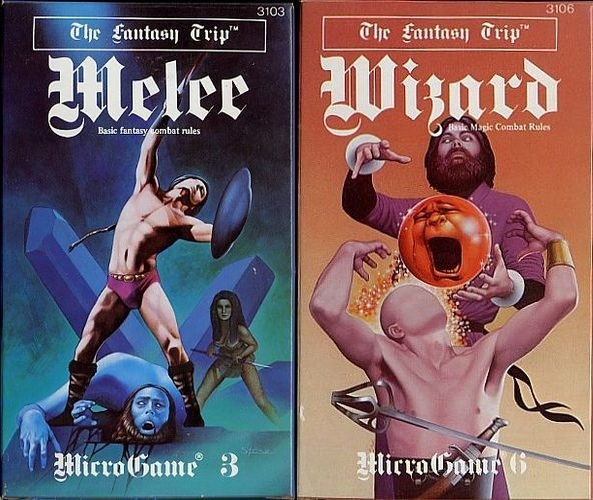 "At the beginning of my career, long before GURPS, I created a roleplaying game called The Fantasy Trip. For decades, the rights have been held by Metagaming, a publisher which is no longer in operation. I'm very pleased to announce that I have regained the eight TFT releases that I wrote myself: Melee, Wizard, Death Test, Death Test 2, Advanced Melee, Advanced Wizard, In the Labyrinth, and Tollenkar's Lair. This is just an initial announcement, to invite you to celebrate with me a day that has been a long time coming! In his 1981 book Fantasy Role-Playing Games, J. Eric Holmes reviewed the first two releases of this system, Melee and Wizard (pictured above), writing that the combat rules, "may be too slow for some players, but they have an air of authenticity which is lacking in the simpler combat systems" (pg 114). You can read more about "Holmes' Other Game" in a thread from 2009 on ODD74. I've also written before about the appearance of the 3d6-roll-under-stat check in early D&D, which actually predates Melee as an isolated mechanic, but not as a generalized system. As to myself, I've never owned or read Melee, Wizard or the Fantasy Trip, so I will be looking forward to any reissues of the original material that Steve Jackson puts out. Per his post here, a Kickstarter for a reissue of Melee may be the first project. After an absence of a few years, "Holmes for the Holidays" is back for 2017! This year I'm giving away a copy of Holmes' Mordred that I liberated from languishing on the shelf of a local used book store earlier this year. A photo of this book is above. "In writing "Mordred," Holmes told me he originally included a line in which Anthony Rogers tells someone: "You can just call me Buck." But the editors told him: "No, he CAN'T just call him Buck!" Due to various copyright considerations, the name "Buck" was not available for use by ACE Books. The company owned only the rights to the novel concept, and didn't own anything else associated with Buck Rogers properties." "Holmes' story is a faithful continuation of Nowlan's Armageddon 2419 novel (a fix-up of the original two stories), which was republished by Ace in a mass market paperback in Aug 1978, possibly in advance of the TV show. While the original novel is clearly the "primary invention", in some ways I found Holmes' Rogers story (which begins 60 years later after the death of Wilma) to be more engaging (better/more dialogue and characterization), though the endless descriptions of dis ray attacks (also shared with the original) were still a bit taxing to this reader." For the give-away I'm using the same system as before: if you are interested, add a comment in reply to this post within the next two days. The two days are the time limit before moderation starts on posts on this blog. After two days, I'll stop accepting entries and treat the list of comments as a table and roll randomly for the winner, using dice from a Holmes Basic set. I'll cover postage (media mail) for any U.S. address. I can ship to other countries but I ask that you cover the difference (any amount over $4) in shipping by PayPal; so if you are overseas please only participate if you have a PayPal account and willing to chip in the extra. I'll estimate the exact shipping and refund the difference if I overcharge at all.This is intended for folks who don't have a copy of the novel, so please don't post if you already have a copy. ...which indicates that number 5 is the winner! That's Patrick Usher. Patrick, please get in touch with me at zenopusarchives at gmail.com. Thanks to all who entered the contest. I hope to do a few more of these type of contests during the year next year as I have accumulated some extra stuff around here. Stay tuned, and happy holidays! Maze of Peril Ch 1, Scene 3: "Murray the Mage, It Is"
After the description of the Underworld, the story returns to the table in the Green Dragon where Boinger, Bardan and Zereth discuss their "proposition" concerning the Underworld. Boinger and Bardan reveal that their partner Murray the Mage has found a secret entrance to the Underworld by studying the "old legends" (one of the "Entrances" referred to by the title of the chapter). This is the first mention of Murray, another major character in the story. Like the others, Murray is based on a PC in Holmes' original campaign - in this case played by Chris' friend Eric Frasier, who wrote an essay for Tales of Peril called "My Time as Murray" (page 299). Boinger explains that Murray will go with them on the expedition, since he doesn't completely trust his partners. They all laugh at this, which we learn is uncommon for Zereth - "he rarely allowed himself more than two" smiles per evening. They launch into a very D&D-esque "discussion of magical detection schemes, march distances, horse power, mercenary men-at-arms, supply dumps and rations". No further details are given here, but some are revealed during the start of the adventure proper. A note from the bar is delivered, which turns out to be from Murray himself, who was surreptitiously watching them before departing. Boinger exclaims "Mother of Mithra" - the first of several references in the novel to real world religions. The note indicates that Murray finds Zereth acceptable and that he will get a "regular share". In his early D&D games Holmes used a rule where hirelings got a half-share of treasure, unless exceptional, as explained in the 1976 Alarums & Excursions article Warrior-For-Hire, also reprinted in Tales of Peril. This is the last scene in the Green Dragon in the first chapter. The next scene jumps ahead to the start of the party's delve into the Underworld. The scene ends with Zereth joking that he has no choice but to join the party as he has "but five silver pieces left" in his purse. All of the prices in Men & Magic, O&D Vol 1, are in gold pieces, making it the standard purchasing unit. Silver and copper only appear as part of treasure hoards in Monsters & Treasure, OD&D Vol 2, with a standard exchange rate of 1 GP = 10 SP = 50 CP noted on page 39. So Zereth's 5 SP here is equal to 1/2 of a gold piece. Murray: Tall, white hair, hooked nose, high-pitched voice, an "old fud" per Boinger. Except for the voice, these are reminiscent of many Gandalf-esque wizards in the days of OD&D. Known as miserly - per Boinger, it is typical that Murray did not tip the barmaid for delivering the note (Boinger gives her a copper piece). Murray as lived in Caladan "for some time now, studying the old legends".